Born in 1953, Aditya Basak graduated in fine arts from the Government College of Art and Crafts, Calcutta, in 1977. As such the region has largely influenced him. He has also derived inspiration from world literature, cinema and history and is deeply passionate about Indian crafts. Basak’s art is a visual rendering of magic realism imbued with idyllic mysticism. His work has a disturbing, haunting quality about it. He is technically very sound and muted colours accentuate the depth of each work. His paintings appear to probe into the human psyche to draw out the strange thoughts that lurk in the subconscious. The usage of multiple colours with the interplay of light, aid the powerful art. He has won several awards including the national award presented by the Lalit Kala Academy in 1986. Since 1984, he has been a member of the Society of Contemporary Artists. Basak uses his art as a medium to help the less privileged. He was part of the Art for Spastics Auction held in Chennai and member of the Help Age All India Show held at the Jehangir Art Gallery a few years ago. He is also an avid supporter of animal rights. 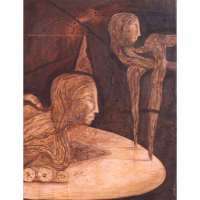 Basak has held several group shows both in India and abroad and participated in numerous exhibitions, including ones such as 'Edge of the Century', New Delhi (1999) and the Bharat Bhavan Biennale (1999),’ Calcutta Through the eyes of painter’ by Birla Academy, ’Contemporary Art of Bengal’ by GALLEARIE'88 at Delhi, Art r1osaic -CALCUTTA'S TRICENTENARY EXHIBITION. Help Age All India exhibition at JEHANGIR ART GALLERY, ‘People for Animals’ organised by MENAKA GANDHI, ‘The Bombay Show’ by R.P.G. and the ‘Harmony Show’ by RELIANCE. He has been bestowed with the National Award -1986 (For Painting), State Government Award-1989 (Calcutta) and has been honoured by South Zone Culture Centre, Ministry of Human Resource Development, Hyderabad (Top 10 TALENTS OF THE COUNTRY). Today, Basak's works are to be found in the collections of the Lalit Kala Academy, New Delhi and the National Gallery of Modern Art, New Delhi. He lives and works in Kolkata, India. This prolific artist has already held more than 66 exhibitions. "Through the medium of the fantastic, I probe the dark alleyways of human consciousness bringing to light the depths of the unconscious"